Clarets duo will keep going in uphill battle! 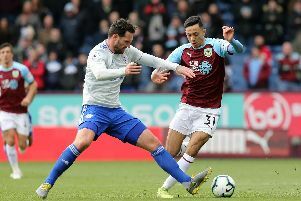 Ashley Barnes spoke of his ‘devastation’ and ‘dejection’ after a 19th defeat of the campaign left the Clarets staring down the barrel of a gun. The club had already secured promotion to the Premier League at this stage last year, but anything less than a win against Hull City at the KC Stadium tomorrow would cement a return to the Championship. After boss Sean Dyche accepted that his side were relying on “myths, legends and folklore” in the aftermath of defeat to West Ham at the Boleyn Ground, Barnes said: “It’s a massive uphill battle to survive. “It’s not been for the want of trying, it’s just the devastation that we know it’s coming close. We know it’s slipping away from our hands. We’re the only ones to pay for that. “We’ve shot ourselves in the foot again but we’ll have to pick ourselves up for a massive game at Hull. It’s an uphill battle but it’s one that we won’t give up on yet. Meanwhile, midfielder David Jones is challenging his team-mates to find that winning formula. “It’s difficult but we just have to keep going,” he said. “The mentality of the squad will be the same - fighting for every point, fighting for every ball. We’ve got to give it everything in the last three games. He added: “Over the last couple of games we’ve allowed the gap to widen which is disappointing. We’ve just got to keep going.